Amongst the Kennedy campus, a variety of transportation methods exist to haul students to and from school. Some walk, take the bus, carpool, drive themselves, or have their family members drive them to school. While each student’s daily commute yields a unique experience for every individual, they all have one thing in common: their everyday concerns of punctuality and safety to their next destination. Despite student conveyance coming across as a simple task, a problem lies in the midst – being late to school. In December 2016, 494 students were surveyed in relation to transportation. 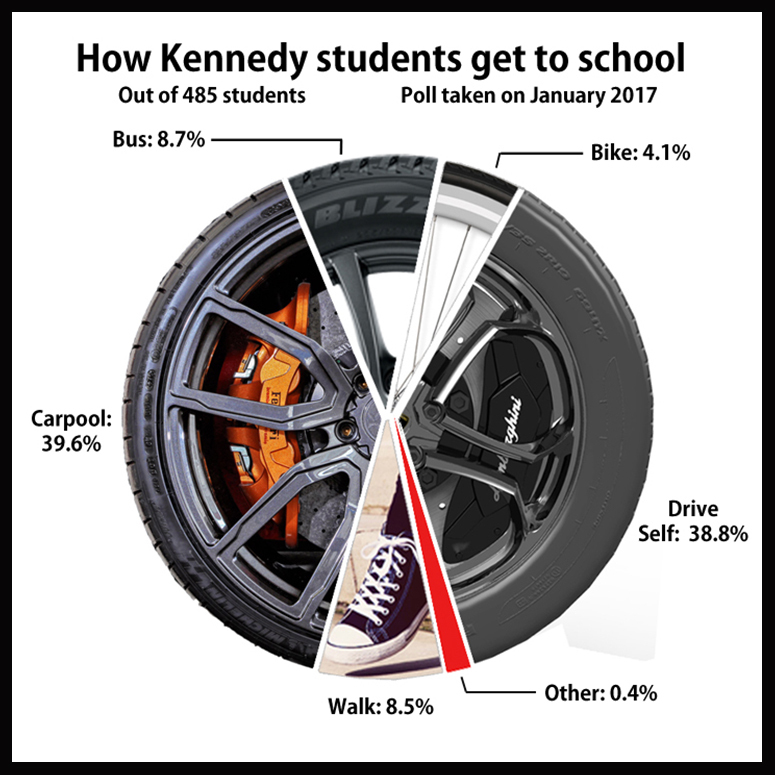 The results showed that 19% (90 students) of the Kennedy student body was late to school, and that 48% of those students were late five times or more. From broken bike chains to prolonged traffic, these simple, uncontrollable occurrences seem to have consequences, leading students to accumulate records of tardiness and lunch detention. As a result, students across the Kennedy campus feel that receiving detention is unfair due to unforeseen scenarios. The struggle of being late to school will always be an issue that many students deal with throughout the course of the school year. Despite the opinions based on the consequence of detention, many students fail to realize the ways in which they can avoid these punishments. Along with tardiness, there also has been a growing concern with inattentive drivers on the road. Many students with their permit or license share the same fear of driving on the road with irresponsible drivers. According to a 2015 report by the Centers for Disease Control and Prevention, 2,333 teens in the United States ages 16-19 were killed in motor vehicle accidents in 2015. The concern of safety for teen and adult drivers has led to many motor vehicle safety campaigns. To spread awareness of motor vehicle safety, the nation has funded many campaigns such as “Click It or Ticket.” The City of Sacramento has also informed the public about the safeties of driving and the negative effects that can come from bad driving decisions. The only advice that can be given to students is to be responsible, as it can also prevent many risky or unpredictable situations and consequences such as tardiness. One careless mistake could result in a lifetime of problems.